1973 1974 and 1975 were the first three years the Firebird (Screaming Chicken) was offered on the hood of the Trans Am. Along with the hood bird came the boldest Trans Am names up to that time. 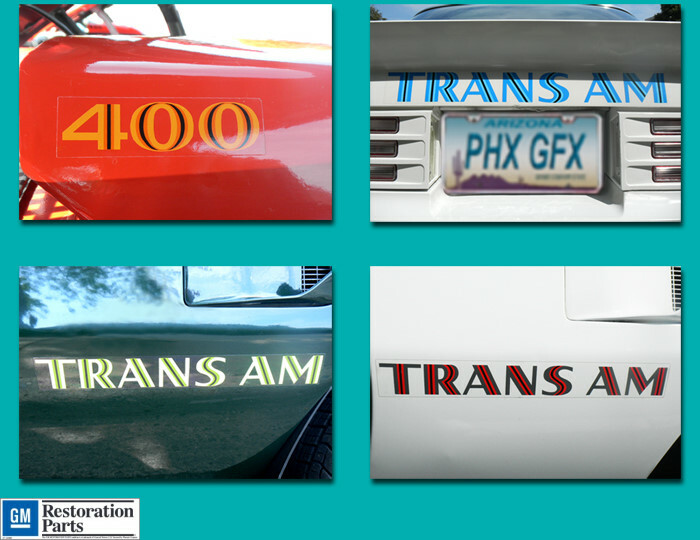 These early year Trans Ams had the fender and spoiler Trans Am names screen printed on clear and the clear between the letters was not removed. These pieces are called Trans Am names on clear. The 400 and 455-HO hood scoop shaker numbers were also produced this way. These seemingly unfinished pieces were how Pontiac provided them on production vehicles. 455 and SD-455 were however originally produced without clear between the numbers. After the 1975 model year, GM cut and removed the clear from between ALL names. Retroactively, they began providing only this cleaner, more finished, product over the counter. In fact, some names that had been on clear were now only offered from GM without clear. This kit provides you and matches the early production OEM NOS names. These name kits perfectly match all our existing bird kits. All five names and numbers will be provided just as Pontiac had produced them in the 'Olden days.